The individual tear open pouch is another type of packaging that has been around for a very long time, but they were only used for a select few types of products. Recent advances in plastics technology over last 2 decades has greatly expanded the range of products can be placed in these types of packages without spoilage, and because they are inexpensive to make compared to rigid containers the popularity of pouch style packaging has really taken off with the manufacturers. 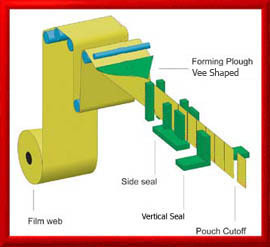 Pouch making is really another type of horizontal form fill seal process. There are basically two types of machines: Intermittent and Continuous. Click on the links below to learn more about each type of pouching machine.